28 hand-painted, playful fish swim together in a kaleidoscope of coastal blues. 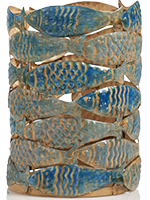 The stamped metal fish are welded together to product a stunning effect on this one-of-a-kind Accent Shade. Item measures 3.9” diam x 6” h.